You All Are So Amazing! Can’t believe it. Just sent out my other blog a couple of hours ago to request as your time permits to send some words of encouragement and support to Terry’s mom for the loss of her husband Jeff today and already the support from you is comming in so quickly! 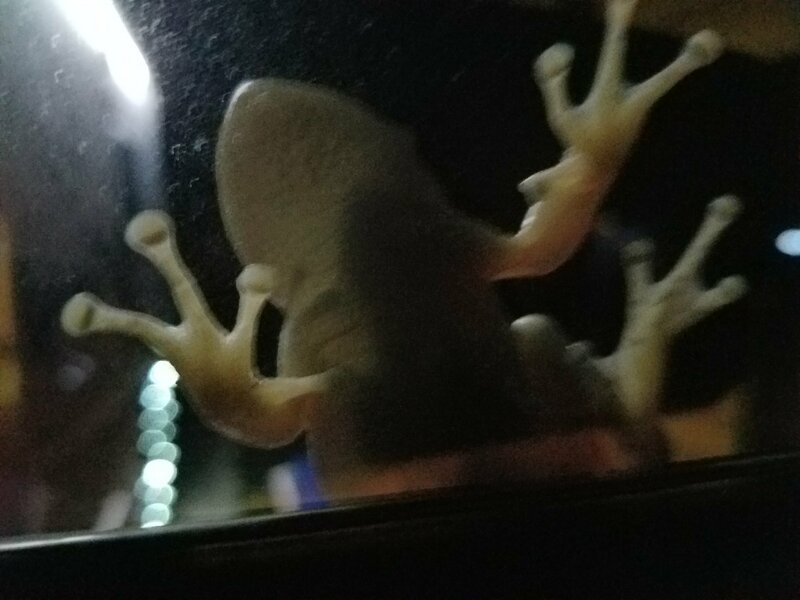 Then, just a few minutes ago I went outside to take my dog Roxy for a poddy break and as I looked up there perched right on my RV window near my dining area was a frog looking in ! It was jumping for joy. I don’t know how it could of got up there? I really think it is Terry again comming back to me to give you his sign of approval and a Big Thank You for thinking about his Mom and sending her such beautiful condolences. Never coincidence, always spirit signs making you aware they are near. Glad Terry is making his presence known to you in special ways you can see. I know…it’s way too cool ! First he comes as a black bird to let you know the tragic news, and then as a happy frog – how could you not recognize Terry in both manifestations! I know. This is quite facinating! I hope you derive some comfort from these appearances! I’m watching The Sound of Music as I read your post, Gary. Yes, no doubt Terry is there. How wonderful!! Terry appeared as the black bird to plant the idea that you must ring his mother, knowing that Jeff’s passing was iminent and then he appeared as the little frog jumping for joy that you reached out at the right moment. The icing on the cake was making sure you were looking at the screen just at the moment when the frog jumped out of Maria’s pocket. Of course, Terry, like me, as a devotee of The Sound of Music would have known the exact moment. I am sure he is smiling broadly at his success in this mission. Yes it is my friend ! What a wonderful moment with Terry! Thank you, as always, for sharing it with us!